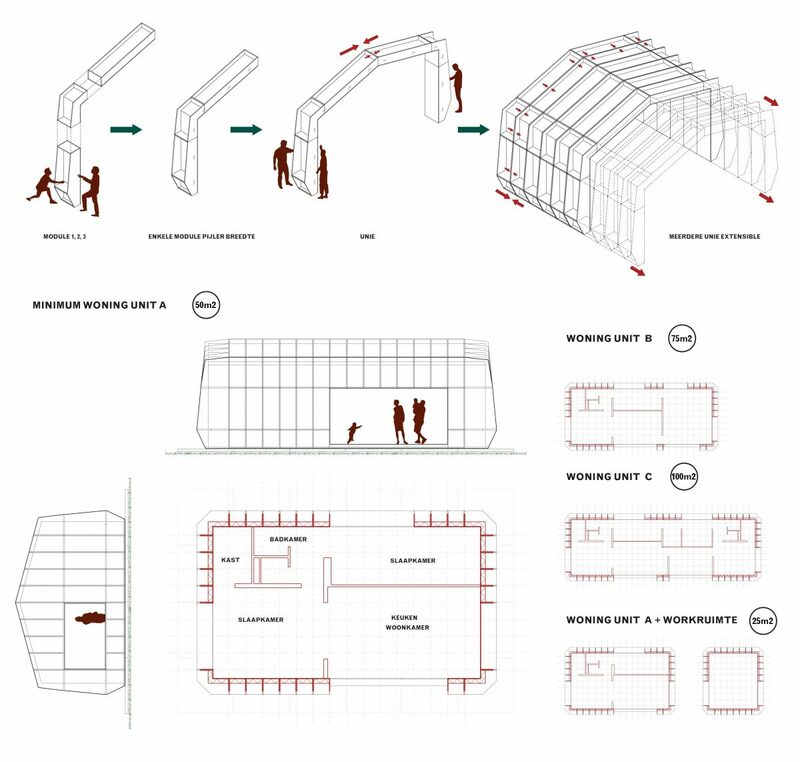 SOLIDTENT is a solution for temporary and flexible housing. The concept is completely reusable and disappears as easily as it appeared. SOLIDTENT can be used quickly in any location without heavy mechanical resources. Both the required numbers and the size of the individual homes are variable. 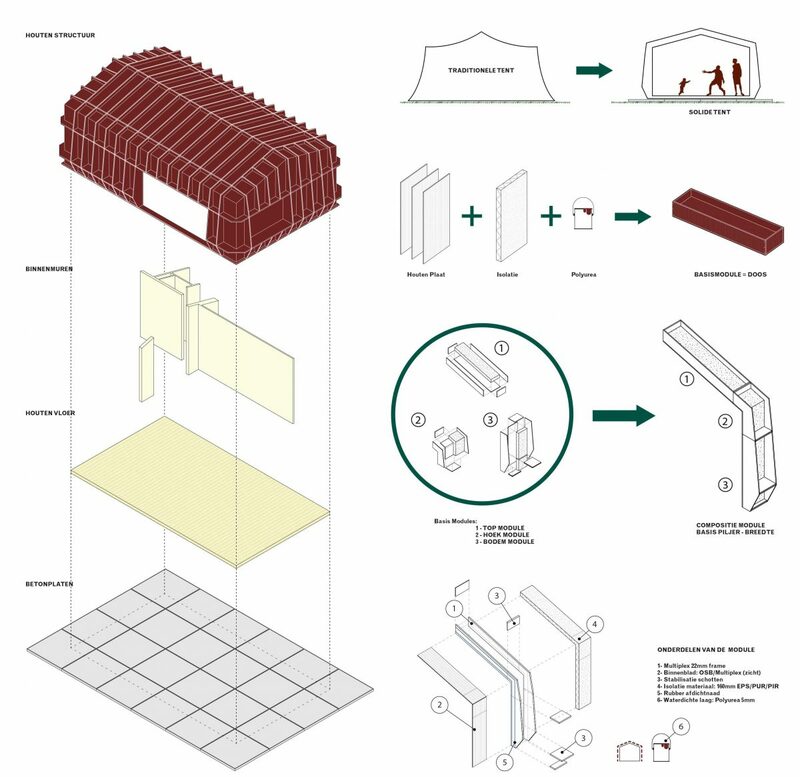 By selecting the materials used, SOLIDTENT offers a safe solution for refugees and temporary housing seekers. SOLIDTENT enables a particularly fast construction time, of which the future residents can devise and execute a significant part themselves. They can contribute their own ideas about the choice of color, placement of façade openings and the configuration of the floor plan. As a result, it is not only cheaper to implement, it gives the new residents more opportunity to take control of their future. SOLIDTENT is ‘off grid’. It offers the quality of a village, with the impact of a campsite. The energy supply depends on wind turbines or photovoltaic cells. As the number of dwellings increases, a choice can be made for the amount of required solar panels, or the size of the wind turbine. This choice is related to spatial feasibility and of course whether the investment for sustainable energy generation exceeds the lifetime of the temporary accommodation. In contrast to wind turbines, solar panels can easily be disassembled and reused elsewhere. Every home has the usual living facilities such as running hot water and sanitation, but through the use of grid-connected all-electric boilers every home is capable of storing the renewable energy from the solar panels or wind turbines for later use. Septic tanks provide storage for organic waste streams, which can be used later for food fertilization and green energy production. The many configurations that SOLIDTENT makes possible, apart from temporary accommodation, can also be used for other purposes. The houses are also ideal as a holiday home and can also be rebuilt in other places due to their construction method. By combining multiple SOLIDTENTs, larger building structures can be created that can facilitate a large combination of small-scale home-work environments. The SOLIDTENT relies on a flexible and modular construction system, that doesn’t require heavy lifting machinery. The modular system allows different configurations of the construction and extendable layouts of the plan. 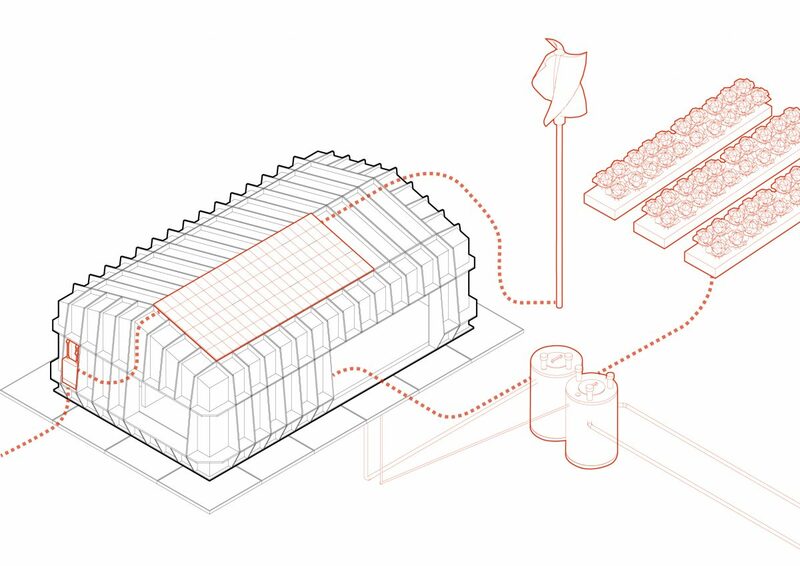 Each housing unit relies on circular strategies: PV panels, wind turbines, water harvesting, electrical boiler connected to a grid between units, waste disposal and transformation on site to produce fertilizers for small scale agriculture and vegetation. The customizable outlook of the units generates a sense of appropriation between the inhabitants and an aesthetic quality for the complex of units.